Summer is here! 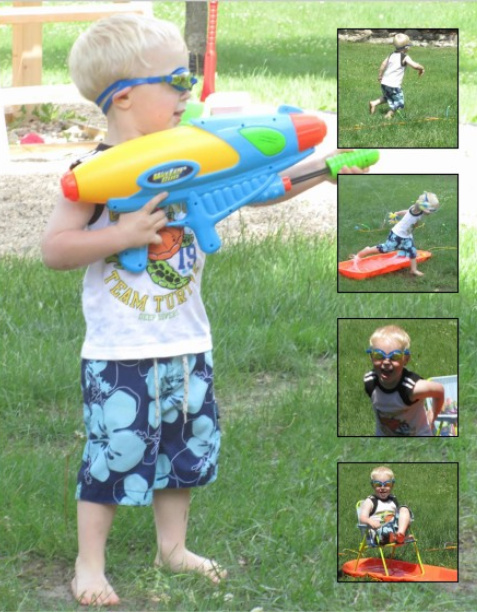 My little boy has been asking several times a week if its warm enough to play with his sprinkler and "water shooter". We decided yesterday was plenty warm so we had some water fun in the backyard. He was pretty proud of his new swimming goggles and he kept them on most of the time. To give him a bit more to do, I filled his sled with water and brought some of the bath tub toys outside (boats and ducks). We also got out the sponge-water-bombs we've played with before and had a water fight. I joined in the fun, but was able to sneak in a few pictures from the patio. Smiles, giggles, and water everywhere! Thanks so much for sharing this at my place, Krista!